Caption: Taj Burrow wins the 2017 Four Seasons Maldives Surfing Champions Trophy off the island of Kuda Huraa. Please be advised, that any audiovisual or image attached or accessed by link through this email (“Content”) are for news and editorial use only described under the “License Terms” below. Kuda Huraa, Maldives (Sunday, August 13, 2017) - Australia's Taj Burrow (AUS) has taken out his second consecutive Four Seasons Maldives Surfing Champions Trophy in perfect 3-to-4 foot waves at the right-hand reef of Sultans. Burrow surfed an incredible event taking out the Twin Fin and Thruster Division to make it to the Grand Final of the ‘world’s most luxurious surfing event’. In the Grand Final, Burrow came up against an in form Rob Machado (USA). Machado had been looking dangerous all event finishing first in the Single Fin and second on the Twin Fin. It was Burrow’s fast and critical surfing however that saw him take the overall win with a heat total of 16.73 (out of a possible 20). Caption: Taj Burrow on top of the Four Seasons Maldives Champions Trophy podium for the second year running. Caption: Rob Machado with another finals appearance at the FSMSCT. Finishing runner-up in the Thruster Division against Burrow was 2001 WSL Champion C.J. Hobgood (USA). The Floridian goofy foot was a standout all event but came up against a rampaging Burrow in the final. Hobgood was unable to get in a rhythm but was thankful to be apart of the Champions Trophy. Caption: 2001 WSL Champion C.J. Hobgood enjoying his first FSMSCT experience. Brazilian big wave inspiration Maya Gabeira (BRA) put on her best performance of the event during the Thruster Division. The goofy foot came just short of a Semifinal berth but was over the moon to have been part of such a special event. She stated this week at the Four Seasons Maldives as a definite life highlight. Caption: Maya Gabeira on a Sultans freight train. Local wildcard Ismail Miglal (MDV) had his best performance in thruster division posting a heat total of 12.50. He wasn’t able to overcome Hobgood in his Semifinal but was stoked to have had the opportunity to surf with and against his surfing idols. “This was the most amazing experience of my life,” Miglal said. Caption: Ismail Miglal having the time of his life at Sultans. The 2017 Four Seasons Maldives Surfing Champions Trophy will run from August 7 – 13 in the beautiful Maldives. Stay tuned as we look to get competition underway in the coming days. For more information on ‘the world’s most luxurious surfing event,’ head to www.surfingchampionstrophy.com, www.worldsurfleague.com, or the WSL App. About The Event. Unique in many ways, the Champions Trophy determines a surfer's heat time based on their age and tests skill across three different divisions: single-fin, twin-fin, and triple-fin thruster. Places are granted by invitation-only to just six world champions in a battle for inner-circle kudos and the US$25,000 prize winnings. Caption: Taj Burrow taking a win in the Twin Fin Division 2017 Four Seasons Maldives Surfing Champions Trophy off the island of Kuda Huraa. Kuda Huraa, Maldives (Saturday, August 12, 2017) - Taj Burrow (AUS) has taken out the twin fin division on Day two of the Four Seasons Maldives Surfing Champions Trophy. Burrow was unstoppable in the pumping 3 – 5 foot clean waves on offer at Sultans as he moves closer to a spot in the overall final. 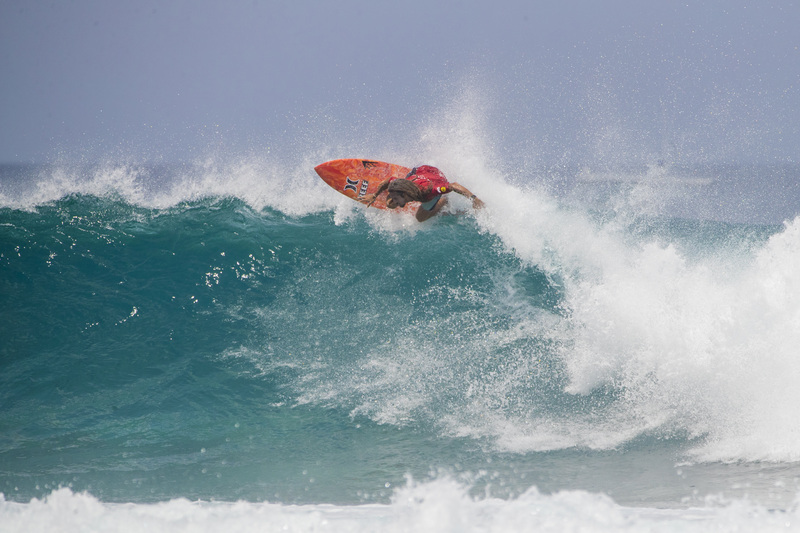 In the final, Burrow came up against form surfer Rob Machado (USA) in a thrilling match-up. After Machado knocked Burrow out in the semifinal of the single fin, Burrow had something to prove and was hungry for redemption. His early round loss in the same division last year looked like a distant memory as Burrow ripped his way to a winning two-wave combination of 16.67. “I was so excited to get the competition started today after a bit of a shocker yesterday,” Burrow said. “I couldn’t believe how good the waves were today, I definitely wasn’t expecting it to be that good, we were pretty spoiled. Everyone was so fired up today, my heat with Ross was so sick, just a real see-saw then the final with Rob was just all time, I'm so warn out now." Caption: Taj Burrow with the twin fin that took him to a win the second division in the Maldives. Machado was the surfer to beat in the twin fin with a solid display of surfing all day. On a board he shaped himself, he posted a heat total of 14.80 in the final but it wasn’t enough to overcome a rampaging Burrow. With this being his second final of the event, he still leads the charge to the overall final of the event. Local Maldivian wild card Ismail Miglal (MDV) put on an impressive display in his opening round heat to overcome 2001 WSL Champion C.J. Hobgood. 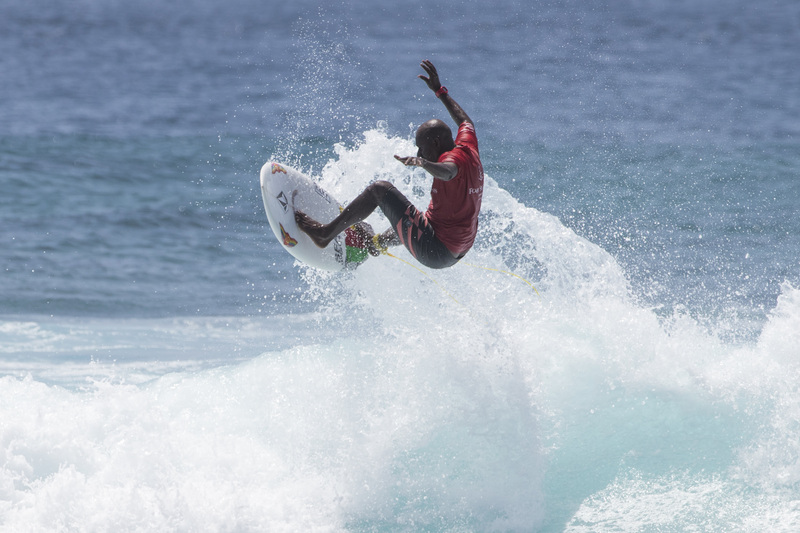 Miglal was electric on his twin fin even throwing a few aerial manoeuvres to move into the semifinal. In the end, he was eliminated by Rob Machado but was stoked to make a heat against some of his heroes. Caption: Ismail Miglal boosting into the semifinals. Caption: Ross Williams with a trademark swoop during the twin fin division. Caption: Rob Machado taking out the single fin division at the 2017 Four Seasons Maldives Surfing Champions Trophy off the island of Kuda Huraa. Kuda Huraa, Male'/Maldives (Friday, August 11, 2017) - The 2017 Four Seasons Maldives Surfing Champions Trophy has finally kicked off at Sultans point in clean 2 – 4 foot waves. Day one saw the completion of the Single Fin division, which was taken out by Californian style guru Rob Machado (USA). Machado came up against fellow goofy-foot C.J. Hobgood (USA) in the final and the two went toe-to-toe, duelling it out on their backhand. Hobgood was in solid form posting a 15.33 (out of a possible 20) heat total but it was Machado’s fluid style and experience on his single-fin that saw him take the victory with a two-wave combination of 15.67. Machado is at the Four Seasons Maldives Surfing Champions Trophy for his second time and had unfinished business having finished runner-up in the single fin last time to Taj Burrow (AUS). Machado got one back eliminating Burrow in the Semifinal on a board he shaped himself. 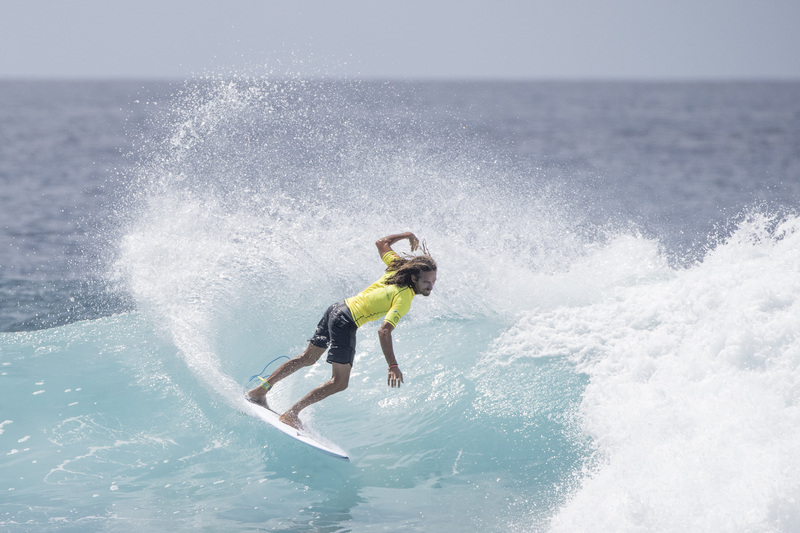 Caption: Rob Machado with the single fin he shaped himself to win the opening division in the Maldives. Hobgood put on a great performance all day but came just short of finding the score he needed. Half way through the final he pulled into a rare barrel but was unable to find the exit, leaving him chasing a 7.68 (out of a possible 10). In the end he was unable to find it but was happy to share the line-up with one of his favourite surfers and good friend. 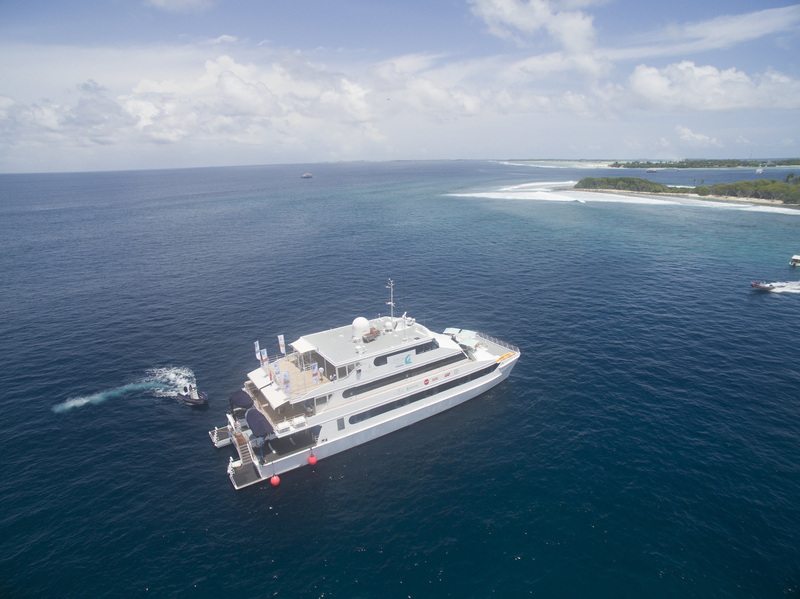 After a few days of waiting, competitors were buzzing with excitement on board the Four Seasons Explorer, ‘the ultimate surf vessel’ and none were more pumped than Hobgood. Caption: 2001 WSL Champion C.J. Hobgood takes second place in the single fin division at the 2017 Four Seasons Maldives Surfing Champions Trophy. Last years single fin winner and overall event champion Taj Burrow was looking dangerous early posting the highest heat total of the day, a 16.77. He was unable to repeat this performance in the semifinal, going down to eventual winner Machado. Caption: Taj Burrow was unable to go back-to-back in the single fin division. Brazilian big wave charger Maya Gabeira (BRA) is used to being the lone female in the line-up and showed it doesn’t phase her to much as she took on Taj Burrow and Ross Williams. Riding a single fin for the first time this week, Gabeira enjoyed soaking up the experience of scoring Maldivian waves with two other out. 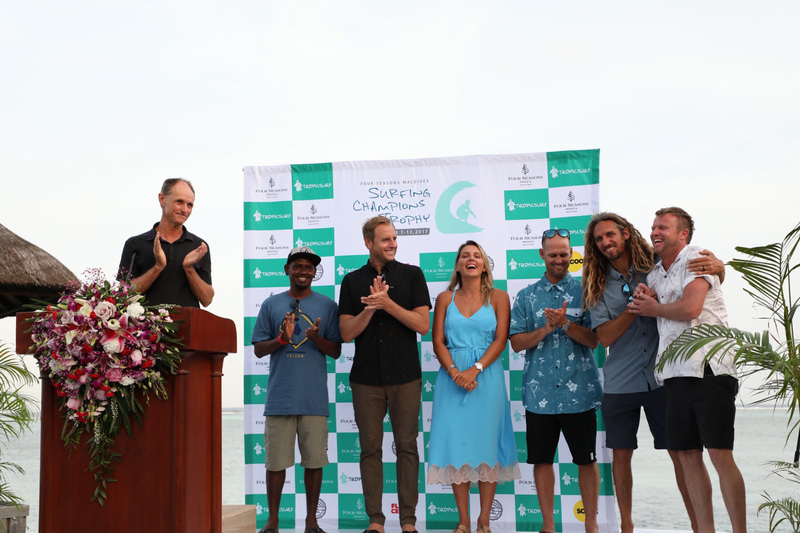 Caption: Tropicsurf founder Ross Phillips introduces the competitors at the 2017 Four Seasons Maldives Surfing Champions Trophy during the official opening ceremony on the Island of Kuda Huraa. Kuda Huraa, Male'/Maldives (Wednesday, August 9, 2017) - With the six invitees to this year's Four Seasons Maldives Surfing Champions Trophy settling in on the idyllic island paradise of Kuda Huraa, the stage is set for the ‘world’s most luxurious surfing event’ to kick off this week at the perfect right-hand reef break at Sultans Point. Having taken out the 2016 event, former WSL Championship Tour (CT) superstar Taj Burrow (AUS) has made it back to the Four Seasons to defend his title. Burrow has put in some time surfing these parts since last year and hasn’t lost much of the competitive spark that saw him make it to World No. 2 on several occasions throughout his career, meaning he will be the one to watch when competition gets underway. Best known for her big wave exploits, Brazilian Maya Gabeira (BRA) comes into the event as the lone female competitor. On her first visit to the Maldives, Gabeira isn’t sure if she’s more excited to be surfing in paradise or coming up against some of her heroes. Caption: Maya Gabeira (BRA) getting acquainted with her new single fin in the lead up to the 2017 Four Seasons Maldives Surfing Champions Trophy. Local competitor Ismail Miglal (MDV) (aka Kuda Issey) is by far the most experienced surfer at Sultans and is relishing the opportunity to share the line-up with some of the world’s best. With the forecast for the event window looking to dish up some tricky conditions, Kuda Issey’s local knowledge will no doubt play heavily to his advantage. 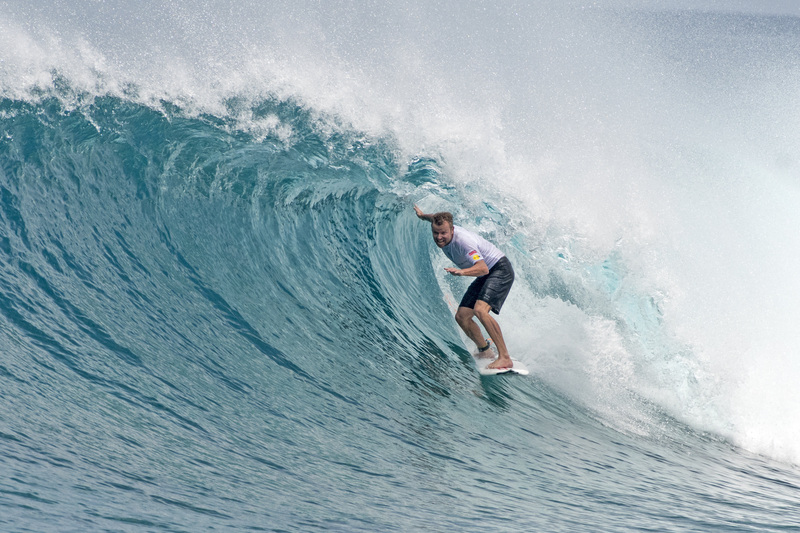 2001 World Champion CJ Hobgood (USA) has made one previous trip to the Maldives and is thrilled to be back. The hard charging goofy footer is stoked to have the opportunity to continue his competitive career in a more relaxed environment while surfing different boards. Returning to the Four Seasons in 2017 is former World No. 2 and Pipe Master, Rob Machado (USA). The ‘cruisey’ Californian has style in spades and serious ability on crafts of all shapes and sizes, making him a perfect fit for the multi-discipline format of the Surfing Champions Trophy. Machado will be surfing the event on a quiver of boards he shaped himself, a first time here at the Surfing Champions Trophy. Another competitor that will be surfing on Machado’s shapes is former CT surfer and WSL commentator Ross Williams (HAW). These days, Williams is utilising his exceptionally sharp competitive mind under the guise of coach to 2016 WSL Champion John John Florence. This week he will pull on that skill set with the competition jersey on for the first time in a long time. Caption: Former CT stars Rob Machado (USA) and Ross Williams (HAW) talking boards before a free surf session in the lead up to the 2017 Four Seasons Maldives Surfing Champions Trophy. With conditions on the opening days of the event window not quite making the grade for competition to get underway, the forecast looks promising for a start this Friday, August 11. Event coordinator and founder of Tropicsurf Ross Phillips has been surfing in the Maldives for around two decades and believes conditions are sure to improve later this week. 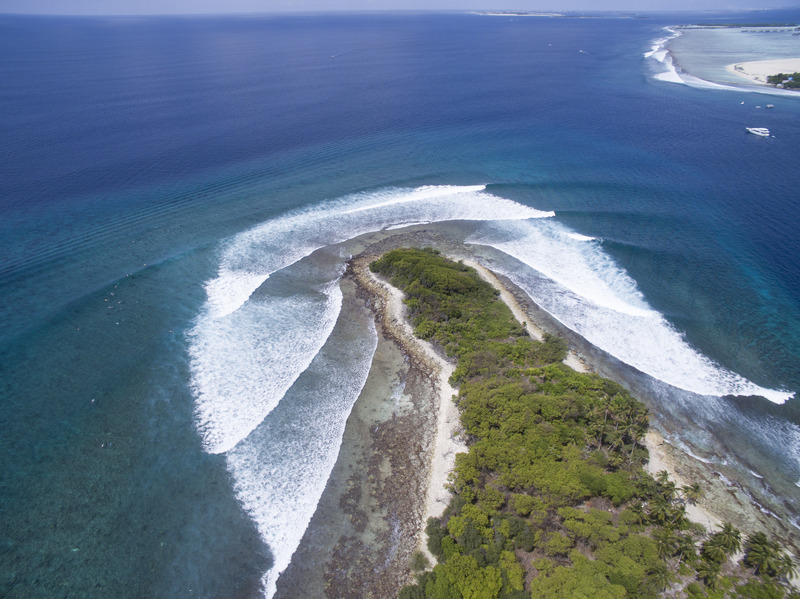 Caption: The epic Four Seasons Maldives Explorer is the base for the Surfing Champions Trophy and is an incredible spot to watch some of the world's best rip up Sultans. Caption: Former world No. 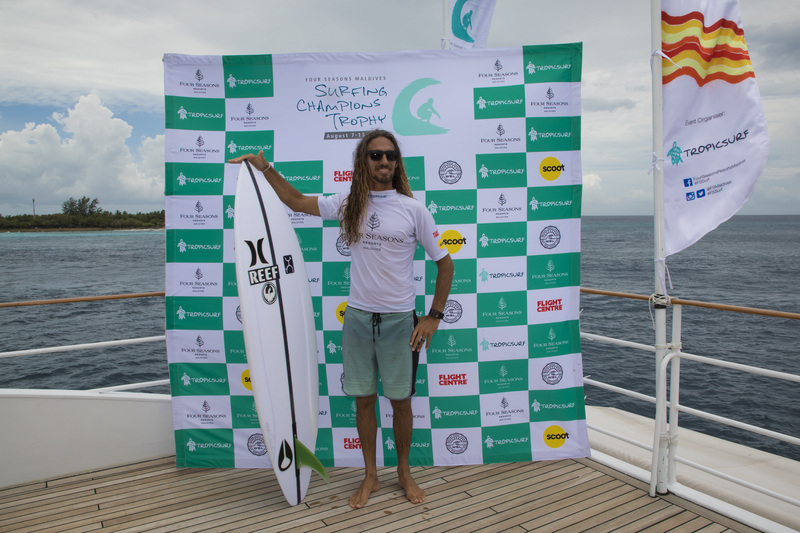 2 Rob Machado will get another shot at taking out the Four Seasons Maldives Surfing Champions Trophy when he returns in August 2017. COOLANGATTA, Queensland/AUS (Tuesday, July 11, 2017) - The lineup for the 2017 Four Seasons Maldives Surfing Champions Trophy is complete with the final three invitees being added to the draw. Joining defending event champion Taj Burrow, big wave inspiration Maya Gabeira and 2001 WSL Champion CJ Hobgood will be former CT Stars Rob Machado andRoss Williams along with local talent Ismail Miglal. Caption: Ross Williams has power and style in spades and will be a welcomed addition to the 2017 Four Seasons Maldives Surfing Champions Trophy line-up. 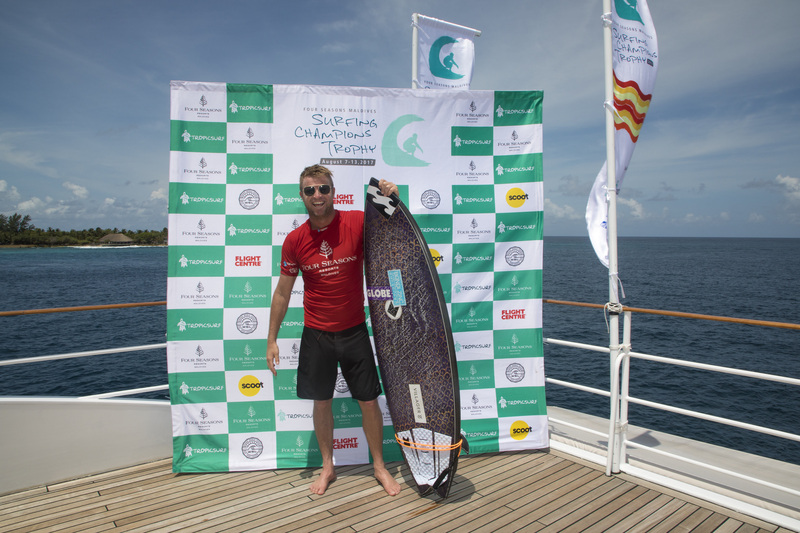 Kuda Huraa, Maldives (August 13, 2016) - The 2016 Four Seasons Maldives Surfing Champions Trophy has been run and won by West Australian surfer Taj Burrow. 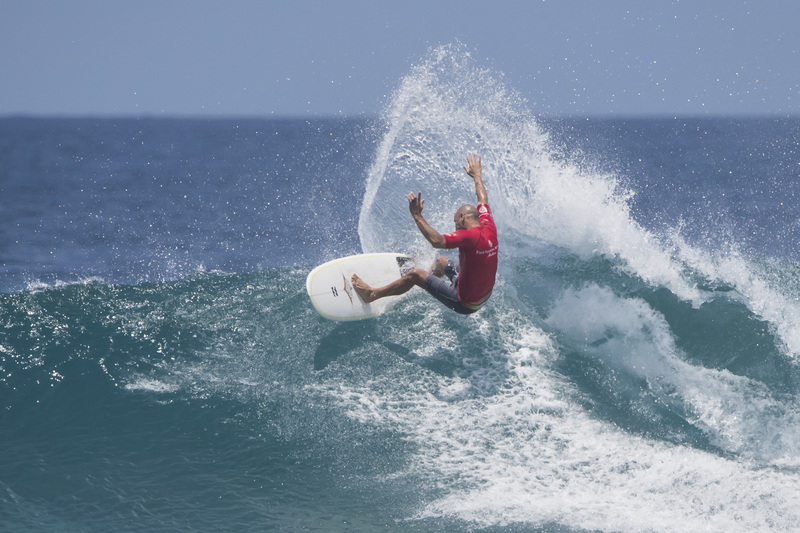 Burrow came up against the event’s defending champion, big wave legend Shane Dorian in the Final. After winning the semifinal and final of the thruster division, coming up against Dorian in the overall event final would be no easy task for a fatigued Burrow. Burrow hit the lead early posting two excellent scores, a 9.17 and an 8.67 (out of a possible 10) for a heat total of 17.84. Burrow was always going to be too tough to beat having only just retired from competing on the elite WSL Championship Tour (CT). The natural footer surfed incredibly on the final day throwing his fins out on critical sections and drawing rail carves out as if he was on tracks. Along with the prize money, for winning the contest Burrow is now invited back to the event next year, which some would say is the best prize of all. Returning to the event as defending champion, Dorian was the one to beat and his performance didn’t disappoint posting excellent scores across all divisions and taking out the twin fin division. This continued in the final where Dorian’s huge power hacks saw him post a heat total of 17.33, just short of the requirement. “That was so fun today,” Dorian said. Earlier in the day the two met in the final of the thruster division, which was taken out by the in form Burrow. Before they got there they had to each overcome a number of the world’s most renowned surfers on their more preferred conventional thrusters. Finishing in equal 5th in the thruster division was Californian style icon and former Pipe Master Rob Machado. Machado was on a tear but came up against a rampaging Travis Logie and Taj Burrow and was knocked out of the division finishing in equal 3rd overall. In one of the closest heats of the contest, WSL Deputy commissioner Travis Logie looked set for a finals birth in the thruster division posting a number of excellent scores with his searing back-hand attack. With less than a minute left, Shane Dorian took off on a set and went to town on it posting an excellent 8.90, putting Logie into second for a division result of equal 3rd and an overall contest result of the same. Finishing in fourth overall was Hawaiian ripper and former Pipe Mater Jamie O’Brien. O’Brien finished second in the twin-fin but was unable to progress through the thruster division in a heat that was low on set waves. Hands down the most impressive performance went to Bethany Hamilton of Hawaii. In the unique format, Hamilton was the only competing female. Hamilton posted an excellent 8.63 and had her male opponents on the ropes. The inspirational goofy-foot was unable to find a back-up score and finished 6th overall at the event. Beaten in the Semifinal by Burrow, local wildcard Hussain ‘Iboo’ Areef put on an awesome display of backhand surfing at his local break, which tested the world class Burrow no end. Check back at WorldSurfLeague.com for more images and information on the 2016 Four Seasons Maldives Surfing Champions Trophy or on the WSL App. About The Event: Unique in many ways, the Surfing Champions Trophy determines heat times based on age and tests skill across three divisions: single-fin, twin-fin, and thruster. Places are granted by invitation-only to six world champions in a battle for inner-circle kudos and a US$25,000 prize pot. Kuda Huraa, Maldives (August 11, 2016) - Shane Dorian (HAW) has continued his love affair with twin fins taking out the division for a second year in a row as competition continues at the 2016 Four Seasons Maldives Surfing Champions Trophy. Dorian looked in good form all day finding a number of long Sultans tubes and unleashing his furious rail game on the clean four-foot walls on offer all day. The big-wave charger was able to post an excellent heat total of 16.24 (out of a possible 20) to overcome fellow Hawaiian Jamie O’Brien in the Final. After a shaky start to the contest during the single fin round, O’Brien was keen to impress on the twin fin which he did, posting impressive scores on his way to the final. Bethany Hamilton was a standout performer on the twin fin. Having only just had a couple of days practice on the unique craft the Hawaiian goofy foot looked like she was on a thruster going vertical turn after turn. It was not enough to progress to the semifinals so Hamilton will look to reset and focus on the thruster division (three fin conventional board). After taking out the single fin division, Australian Taj Burrow was hoping to set himself up for an overall final appearance with a solid result in the twin fin. This wouldn’t be the case as Burrow was unable to find a solid scoring wave while O’Brien and Dorian went blow for blow pulling into long draining barrels in the dying minutes of the heat. Also being out done by the Hawaiian duos tube time was local trials winner Hussain ‘Iboo’ Areef, who’s stylish backhand was unable to get him the nod from the judges on this day. “It was fun out there but quite hard,” Areef said. Travis Logie may swap his thruster for a twin fin after the goofy foot South African put on an absolute clinic at Sultans. Logie posted a solid heat total of 14.97 but was unable to overcome O’Brien who was given an excellent score for his tube riding. Rob Machado was unable to make it back-to-back finals appearances as he came up against a rampaging Shane Dorian. In a heat filled with non-stop waves, the two friends went wave for wave each posting a number of scores in the excellent range. Machado’s amazing heat total of 18.00 wasn’t enough and Dorian took the heat win by just 0.77 of a point. Check back at WorldSurfLeague.com for more images and information on the 2016 Four Seasons Maldives Surfing Champions Trophy or on the WSL App as competitors ready themnselves for the thruster division. Kuda Huraa, Maldives (August 10, 2016) - Competition is underway at the 2016 Four Seasons Maldives Surfing Champions Trophy with Day 1 seeing competitors return to basics and hitting the water on single fin boards. Taj Burrow (AUS) took out the division in pumping 3 to 4 foot clean right-handers at Sultans. Burrow, who had only just ridden a single fin for the first time yesterday put on an amazing show all day pulling into barrels and smashing vertical reentries on the groomed walls of Sultans. In the final, Burrow came up against former Pipe Master Rob Machado (USA). The two went blow for blow but it was Burrow who came out on top with a heat total of 14.94 (out of a possible 20). Machado, who was surfing on a board he shaped himself, was a real standout. Surfing a single fin at a wave like Sultans on your backhand is no easy task, but Machado made light work of it posting high heat scores all day. 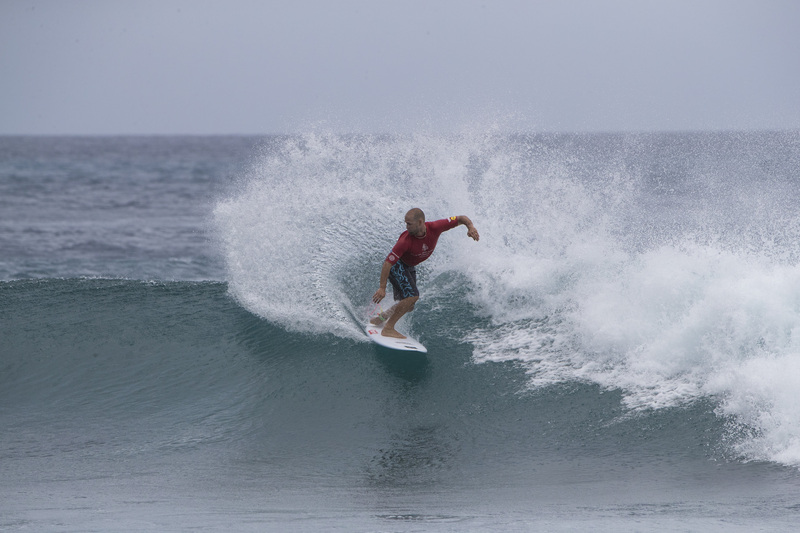 Last year’s event Champion Shane Dorian (HAW) came up against childhood friend and single fin master Machado in Semifinal two. Dorian tucked into a number of barrels for a heat total of 15.34 to tie with Machado who won on a count back due to receiving the highest single wave score of the heat. Semifinal one was an amazing duel between Taj Burrow and WSL Deputy Commissioner and former CT competitor Travis Logie (ZAF). Logie’s backhand was on point going vertical on critical sections to earn himself a heat total of 17.06. He was unable to overcome Burrow’s division high score of 18.44. In one of the slower heats of the morning, Hawaii’s Jamie O’Brien was unable to find an early score as the ocean went flat. As the heat progressed he began to develop momentum as the waves built. Left needing a 8.40, O’Brien took off on one of the better looking waves of the heat pulling into a long barrel across the inside section; unfortunately it was after the siren and O’Brien bowed out of the day’s competition. Local Trials Winner Hussain ‘Iboo’ Areef (MDV) had to ask a friend if he could borrow a single fin as the young Maldivian had never ridden one before. His lack of experience did not show as the goofy footer nailed backhand hit after backhand hit. His heat total of 12.40 was not enough to move into the Semifinals so Areef will now set his sights on the twin fin division. Check back at WorldSurfLeague.com for more images and information on the 2016 Four Seasons Maldives Surfing Champions Trophy or on the WSL App as competitors ready themnselves for the twin fin division. Kuda Huraa, Maldives (August 9, 2016) - A fresh cast of competitors has arrived on the beautiful Island of Kuda Huraa and hit the water for the first time in preparation for Day 1 of the 2016 Four Season Maldives Surfing Champions Trophy. They have been greeted by flawless 3-foot waves at the right-hand reef break of Sultans. On her second time to the Maldives, lone female competitor Bethany Hamilton (HAW) has been enjoying the challenge of riding the different equipment required for the unique format of the Champions Trophy, which involves surfers competing on single-fins, twin-fins and thrusters over three separate competition days. Only a few months off the Championship Tour and Taj Burrow (AUS) is relishing the opportunity to surf in an event with such a unique format on different equipment, in such an exotic location. Known the world over for his ability and style on all sorts of surf-craft, Rob Machado (USA) comes into the event a sure favourite in the single-fin division, especially once he becomes more comfortable on the right-hand walls of Sultans. WSL Deputy Commissioner and former Championship Tour competitor Travis Logie will be donning a contest jersey for the first time since leaving the CT in 2014. The silky smooth goofy-footer is another competitor who is only just experiencing the joys of surfing on a board other than the traditional thruster. This year the Four Seasons Maldives Surfing Champions Trophy will encompass a local trials winner. In 2016 the lucky local is goofy-foot ripper Hussain ‘Iboo’ Areef. Iboo is a standout at Sultans and can’t wait to paddle out with his idols in a contest jersey. Competition is set to get underway tomorrow with the Single-fin division hitting the water first. Check back at WorldSurfLeague.com for more images and information on the 2016 Four Seasons Maldives Surfing Champions Trophy or on the WSL App. Coolangatta, QLD/AUS (Tuesday, July 19, 2016) – The 2016 Maldives Surfing Champions Trophy line up is complete and it is one of the most star studded the unique event has seen. Joining Pipe specialists Jamie O’Brien, former Championship Tour competitor and WSL deputy commissioner Travis Logie and 2015 event champion Shane Dorian will be Taj Burrow, Bethany Hamilton, Rob Machado and local champion Hussain 'Iboo' Areef. Taj Burrow is a surfer that needs minimal introduction. Taj is known for his cheerful demeanor and dynamic surfing. The West Australian burst onto the scene in 1999 with a groundbreaking profile movie (SaboTaj) and impressive competitive results, Burrow finished No.2 in the world in his rookie season. He stayed on tour for almost two decades and notched up 12 CT victories. After calling this year’s Fiji Pro his last CT event, Burrow now has more time on his hands to attend more diverse events like the Four Seasons Maldives Champions Trophy. Bethany Hamilton was born and raised on the Hawaiian Island of Kauai where surfing became a strong part of her life from a young age. Hamilton began to enjoy much competitive success from a young age winning a number of local and regional events. In 2003, Hamilton lost her arm when she was attacked by a tiger shark while surfing near her home. Exhibiting her trademark determination and love of surfing, Bethany returned to competition just seven months later, placing 5th in the 2004 NSSA nationals (winning it the following year). A truly inspirational soul surfer, Bethany’s career highlights include: Hawaiian State Champion, T&C Pipeline Women’s Pro winner (2007), Surf n Sea Pipeline Women’s Pro winner (2014), and 3rd place at this year’s Fiji Women’s Pro. Hamilton’s competitive prowess coupled with her strong passion for surfing. Considered one of the smoothest surfers of his generation, Californian Rob Machado is an iconic soul surfer, spending over the last decade travelling the world surfing the most perfect waves he can find, usually on different and experimental equipment. Some people forget however that through the nineties, Machado was a solid fixture in the WSL CT top 10, even making it to World No. 2 in 1995 and was seen as a formidable opponent by his fellow competitors. Machado’s ability on boards of all shapes and sizes will see him as a major threat when competition gets underway at the 2016 Four Seasons Maldives Surfing Champions Trophy. Event coordinator, Mark Winson of Tropicsurf, predicts the most exciting year yet with this incredible and diverse line-up of competitors. For the first time in the event's history a local wildcard will go head to head with the world's best in the main event. Hussain 'Iboo' Areef is widely recognised as Maldives' national surfing hero. The reigning Domestic Champions Trophy winner and successful Maldives Open campaigner will be a legitimate threat on the world stage of the Champions Trophy. "I am honoured to have this opportunity to surf in the Four Seasons Champions Trophy this year”, Areef said. “I am so stoked to be able to surf with my heroes. Thank you Four Seasons for giving a Maldivian a chance to participate in this event. I'm really looking forward to it"
Equally as exciting is the announcement that the upcoming Maldives Open surfing event will be used as the selection competition to determine the highest placed local surfer for future Champion Trophy’s. Mark Winson of Tropicsurf sees this as one of the most thrilling evolutions of the Champions Trophy. "There is so much surfing talent here in the Maldives and the Maldives Open is widely regarded as the highest level of domestic competition in the country, Winson said. “It's the perfect opportunity for local surfers to earn unequalled bragging rights, a share of US$25k prize money, and the Champions Trophy. I'm sure that Iboo and surfers just like him will be real contenders in this event for years to come"
"Local surfers are really excited to see one of our own go head to head with the world's best. It's a tremendous opportunity for Iboo on the world stage and we're confident that he will do really well. Furthermore, to now have the Maldives Open as the qualification event for future Champions Trophy’s is a great opportunity for any Maldivian surfer to put themselves up against the likes of surfers like Shane Dorian or Taj Burrow. That's such a great step forward for local surfers and the Champions Trophy concept"
The 2016 Four Seasons Maldives Surfing Champions Trophy will run from August 8-14. For more information head to www.WorldSurfLeague.com, www.surfingchampionstrophy.com or check out the WSL app. About the event: Unique in many ways, the Surfing Champions Trophy determines heat times based on age and tests skill across three divisions: single-fin, twin-fin, and thruster. Places are granted by invitation-only to six world champions in a battle for inner-circle kudos and a US$25,000 prize pot. Each heat is run with a timing handicap per competitor’s age; so, the older the competitor the more time they have in the water. Four Seasons Resorts Maldives added a new photo. Four Seasons Resorts Maldives shared Tropicsurf's post. Four Seasons Resorts Maldives added 9 new photos. Four Seasons Resorts Maldives updated their cover photo. Video - Can you believe it's March already? As the months pass through the sunsets remain constant.